We are biking along lake Tyin on our way to Eidsbugarden, a popular place in the mountain massif of Jotunheimen. In the back the distinct peak of the mountain Falketinden. WIKI: Falketind is a mountain in the municipality of Årdal in Sogn og Fjordane county, Norway. 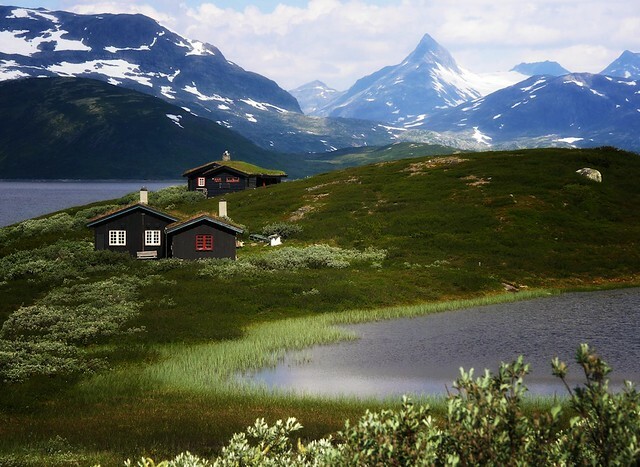 It is located in the Jotunheimen mountain range inside the Utladalen Landscape Protection Area. The mountain is 7 kilometres (4.3 mi) east of the old mountain farm, Vettismorki, and 7.5 kilometres (4.7 mi) northwest of the lake Tyin. 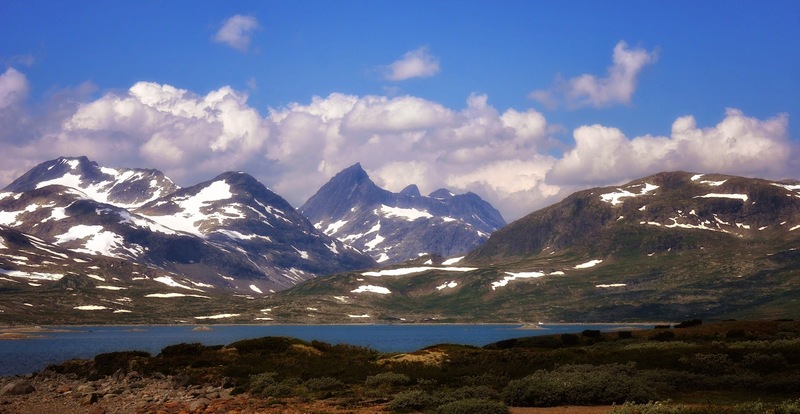 The 1820 ascent was the first ascent on an alpine mountain in Norway. A climbing party which included Baltazar Mathias Keilhau and Christian Peder Bianco Boeck went via Snøggeken (Falkbreen) and the northern ridge. At that time the mountain was named Koldedalstinden, but Aasmund Olavsson Vinje renamed the mountain Falketind more than fifty years later. 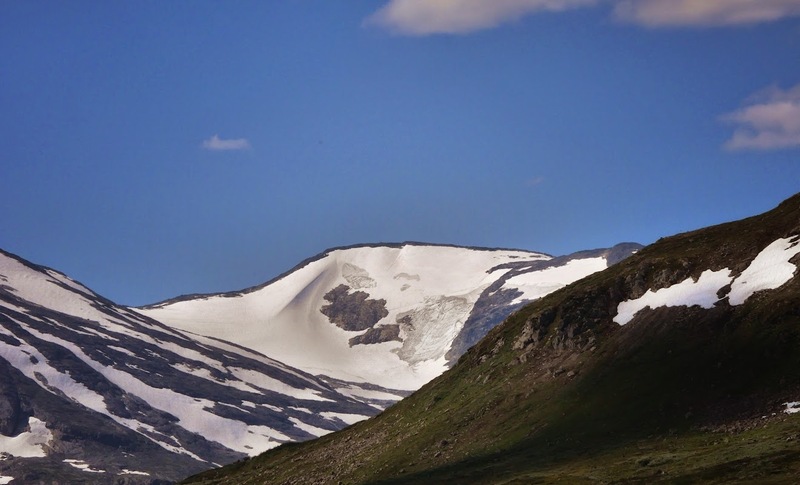 In retrospect, the expedition leading to the first ascent became known as the "discovery of Jotunheimen" (Jotunheimens oppdagelse). Another vista on our way along lake Tyin to the high peak of Store Skagedølstind in the mountain massif Hurrungene. Far away we can see this small glacier: Koldedalsbreen. From WiKI:Koldedalsbreen is a glacier in Årdal municipality in Sogn og Fjordane. It lies just west of the lake Tyin Koldedalstind between the north and the south Breidkvamsnosi. Just south of the glacier is a mountain with no name with a height of 1822 meters above sea level.